All the necessities for quick projects or repairs on the go! Classic wicker basket has a padded fabric top accented with delicate lace. Imported. 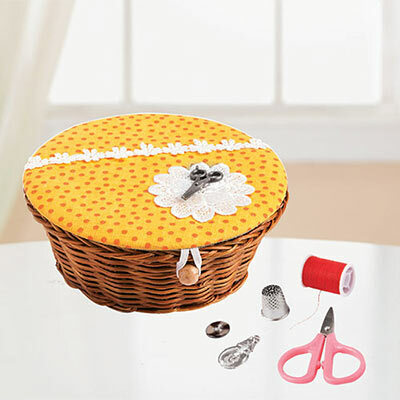 Mini Sewing Basket Set includes: small pair of scissors, 6 colors of thread, flower-shaped needle holder, needle with round holder for storing extras, 2 safety pins, 3 buttons, seam ripper, thimble and threader. Basket is 5" dia., 2" h. 21-pc. set.